A few years back the hillside in front of our home was taken over by the noxious weed knapweed. Living so close the river we didn't want to use any harmful sprays and so took on the daunting task of pulling the weeds by hand and making sure that we kept those that we missed from going to seed. What seemed like an impossible task has finally paid off, with our perennials finally taking over and keeping the rest of the knapweed at bay. This little quilt is in celebration of beauty that exists after great effort. I created the tiled background based off of a technique I learned from Gloria Loughman (see her book Radiant Landscapes.) 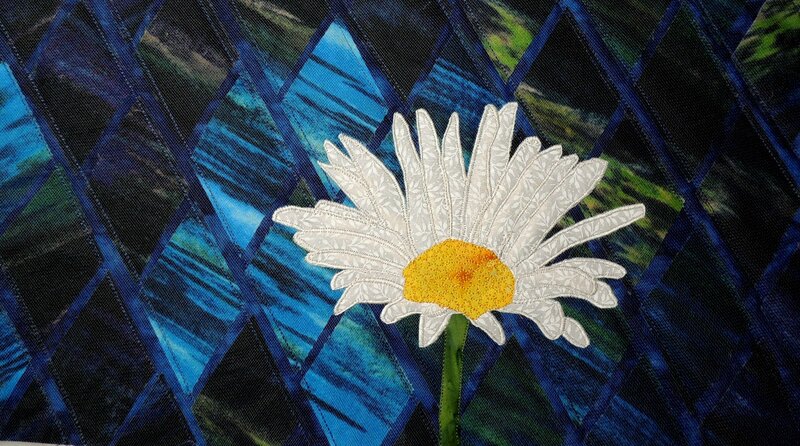 The daisy appliqué was made off of a photo that I took from our front garden bed. All layers were then quilted and bound, and finished with a hanging sleeve to make it simple to enjoy this work in your home or office.